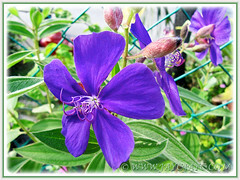 Tibouchina urvilleana, truly a vibrant purple glory bush! Such vibrant purple blooms of Princess Flower is definitely a sight to behold and a must for gardeners! We first sighted a row of these glorious bushes during our vacation at Cameron Highlands in late October 2013. Simply irresistible and absolutely spectacular! 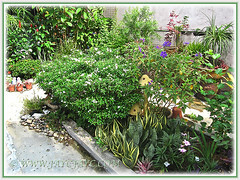 Hence, we bought a pruning shear and took some cuttings home and hoped to root them in a pot. With great enthusiasm, we watch their steady growth and expectedly it was a great success, rooting easily without any need of rooting hormone. We transplanted only one young plant, the sturdiest of the lot, into a large pot. Botanical Name: Tibouchina urvilleana (Syn. 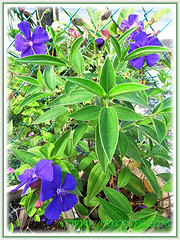 : Tibouchina semidecandra, Tibouchina maudhiana, Lasiandra semidecandra). 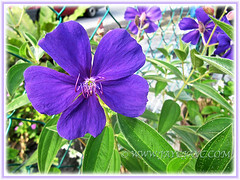 Common Name: Princess Flower, Glory Flower/Bush, Purple Glory Tree, Lasiandra, Pleroma, Brazilian Sendudok. Etymology: The genus name, Tibouchina was given by French botanist Jean Baptiste Aublet. It is derived from the indigenous language of Guiana. The species urvilleana is in honour of Jules Sebastien Cesar Dumont d’Urville, a 19th century French explorer and botanist. Origin: Native to the tropical rainforest in southern Brazil. Widely cultivated in warm regions worldwide. 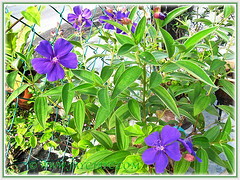 Features: Tibouchina urvilleana is a charming species of the genus, Tibouchina that consists of about 350 species. An evergreen perennial shrub, the Princess Flower is vigorous grower and can reach 3m tall with a spread of 1.5-2.5m. However, its height can be controlled below 1.5m with proper and regular pruning. It is considered an invasive species in Hawaii. Stems and branches start off green and covered with soft reddish-brown hairs but turn brown and woody with age. Foliage is dense. The simple, opposite leaves are velvety and covered with soft hairs, oval-shaped, coloured greyish-green to medium green (lighter shade on the underside of leaves), with obvious pale green longitudinal veins and finely toothed margins. Each leaf is 5-10cm long and 2.5-4cm wide. An everblooming plant that produces striking, five-petaled flowers in brilliant deep/royal purple and are held on terminal panicles above the foliage. These large saucer-shaped flowers, each measuring 8cm across has a cluster of protruding purple stamens in the centre that curve upwards near the tip. Flowers will last only about a day. 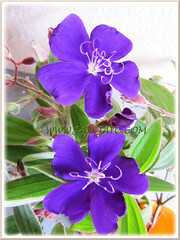 Culture (Care): Tibouchina urvilleana grows easily with minimum care. Light: Full sun and heat tolerant. Soil: Grow in organic-enriched and well drained soils that is slightly acidic. However, it’s adaptable to most garden soils such as sandy clay loam soils. Others: To maintain a round-shaped tree and to keep it from being leggy, it needs regular pruning and training. Feed once monthly with a balanced organic fertiliser. Generally free from garden pests. Propagation: By tip or softwood cuttings that root easily in moist soil with no rooting hormone needed. Can be propagated by seed or division of clumps. 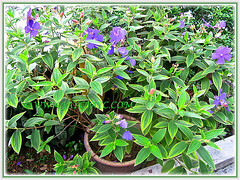 Usage: Plant Tibouchina urvilleana as a showy landscape plant, or train it as a specimen in your garden. An attractive ornamental plant that’s most suitable for outdoor living areas such as sunny patio or decks. 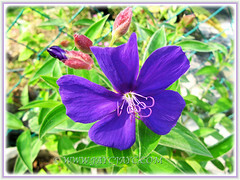 Undoubtedly Princess Flower is highly recommended in any garden as an attention-grabber with its gorgeous and large brilliant purple flowers. Excellent for use in shrub borders or as a screen. Ideal in container planting or above-ground planter. Attractive to butterflies. Also, it can be used as cut flowers to decorate homes.